1. Offices - Newbury Town Centre - Quintons are instructed TO LET modern offices set within the Oxford Square development. The space totals 2,245 sq. ft. and includes ample parking. 2. Retail & Residential – Newbury Town Centre – We are instructed to market FOR SALE a ground floor retail unit which is let for 15 years at £16,000 per annum together with a 2 bedroom apartment above (currently vacant). 3. Warehouse with offices – Membury, near Hungerford – Quintons are instructed to offer For Sale a warehouse with offices which total 5,777 sq. ft. The property includes parking and small yard to the rear together with two loading doors. 4. Retail unit – Hungerford – This retail unit currently trades as a hairdresser and beauticians. The space totals over 2,000 sq. ft. but does not attract business rates for small business users. The property also includes 4 parking spaces to the rear. 5. Workshop & Yard, Burghclere – We are offering TO LET a workshop and yard. The workshop totals 647 sq. ft. and yard is large enough for storage or parking of vans. The property does not attract business rates for small business users. 6. Offices/ retail, Northbrook Street, Newbury – Quintons are instructed TO LET first floor offices/ retail space within Northbrook Street. The space totals 2,000 sq. ft.
7. Bartholomew Street, Newbury – Also on the retail front we are instructed to offer 450 sq. ft. retail space FOR SALE or TO LET. 8. Kingsclere - The former Sasso Restaurant at 10-12 George Street is FOR SALE. The property totals 3,687 sq. ft. over ground and first floors. 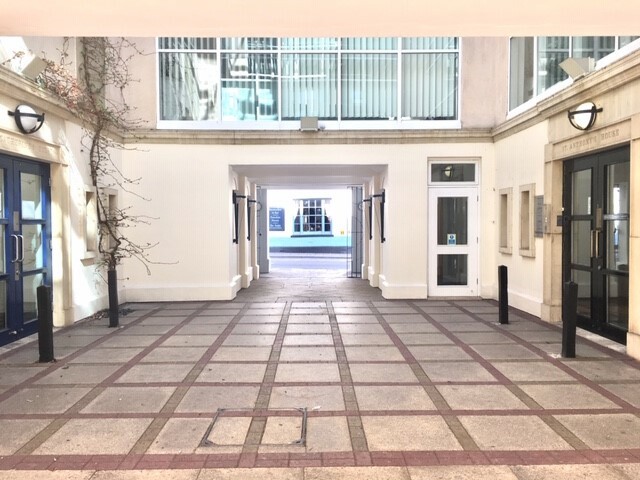 The space includes fully fitted kitchen and can be used as a restaurant/bar with letting rooms above, retail or conversion to residential accommodation. 9. Newbury Investment - Quintons are instructed to sell Saddlers Court, The Broadway which currently comprises 3 retail units but could be used for other uses subject to planning. The property currently produces an income of £14,500 per annum but has a vacant space. We understand the property could be converted to residential or other uses subject to planning. 10. Newbury - First floor office space at 5 West Mills. The space is laid out in two suites available as a whole or separately. The space ranges from 840 sq. ft. to 1,882 sq. ft. and includes parking. Further amenities include gas central heating, air cooling to parts and data cabling. For full details or further information on any of our commercial properties available for sale or to let please contact Shane Prater on 01635 551441.